The donation will be used primarily for the Georgetown branch of the YAP, which is run in conjunction with the Anglican Diocese there. YAP Coordinator James Browne expressed how grateful the Georgetown YAP is for the much needed financial assistance. âI hope we see it as a start to get good things going!â he shared. 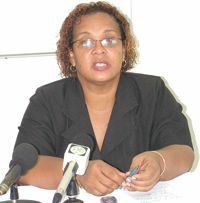 Browne further issued an invitation to the Fair Trade Organisation representative to visit the Georgetown branch to see exactly how the money is being used. According to Marion House Director Deborah Dalrymple, â…YAP is designed to assist young people who may not have finished school, for whatever reason…â Dalrymple explained that the programme has two components – Life Skills and Skills Training. The life skills component aims to improve the participantsâ communication skills and their ability to interact with each other and society on a whole. The skills training segment links the participants with trainers and provides them with apprenticeships within which they can develop careers.